GTEye Progressive Brake Spring for Logitech G27 – Selah. Update 2015-07-03: I just put in the new trio of springs tonight and I am very pleased indeed! I had previously put in and removed the brake due to an Achille’s Tendon issue but I’ve now put them all back in and they absolutely transform the pedals into a much higher quality pedal set. The feel is just so much nicer and more informative. I still say a must-have upgrade for G25/G27 pedal owners and well, well worth the price. 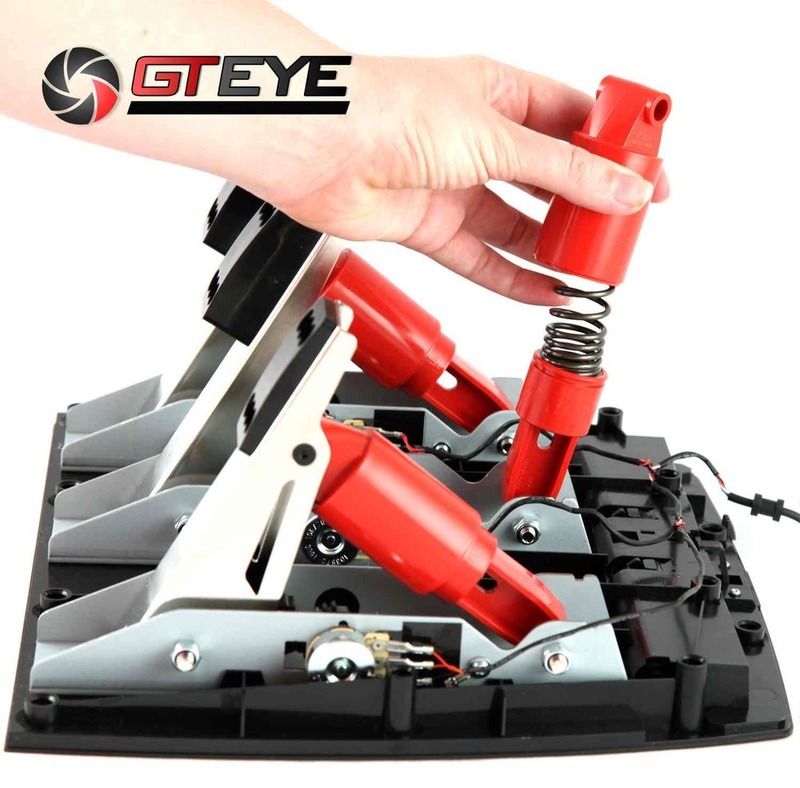 Update 2015-06-05: GTEYE has released throttle and clutch springs! I haven’t tried them but if they do for throttle and clutch what they do for brakes they’re a must have for G25/G27 pedal owners! Update 2014-09-01: Following up on my concerns about my wheeled office chair moving too much because of the new spring stiffness – it’s fine now and my chair stays in one place. I didn’t need to do anything to the chair to get it to stick so I’m happy about that. Update 2014-08-20: The pedal now feels very pliable now, very movable, not the stiff thing I thought it was in the beginning. This is great! I can still feel the progressiveness of it and I can still finesse the top range of motion into corners where fine motor control is needed. It’s amazing how much my perception of the feel of this pedal has changed, for the better, since I started using it just over a week ago. Well worth $30 as the first upgrade for Logitech G27 owners! Update 2014-08-15: I have to say I’m back to normal and at home now with this new brake spring. I feel I’m more consistent, as well. I’ve put in a lot of laps of practice in iRacing before stepping into a few races and I have to say, while I had my doubts about how I would perform with the new brake spring, I performed quite well in the race and the brake pedal was really not a problem for me. This is a great upgrade and I highly recommend it for G27 owners! Update 2014-08-11 – 2: Just a few hours after I received the brake pedal, and I was getting 1:54s/1:56s on a course I can do routinely at 1:52, I’m already back at 1:52.5s high 1:51s! I’m also starting to feel how this brake is going to help me be more consistent. The resistance you feel from the pedal really helps you stick to a certain level of pressure much more easily than with the stock pedal which, I take it, is so easy to move around that your legs just don’t have that level of fine motor control. I’m very pleased to see how this is turning out so far! Update 2014-08-11: Check your brake calibration! In iRacing I noticed a little bit of red was showing on the brake pedal meter while driving without touching the pedal. That meant the game thought I was pressing the pedal a little bit. No problem, though, just go to your options, click on the Pedals button and it’ll allow you to recalibrate. That fixed it for me! Purchasing was easy, no hassles, just an eBay purchase. The first thing I noticed when I received it was how minimal the packaging was, and why shouldn’t it be? It’s just a spring a few inches long. The other thing I was pleased about was that it arrived in Canada, from Australia, as promised, in about 6-8 business days. The little plastic envelope it came in contained another, smaller, bag for sealing the spring and a simple business card with “Enjoy!” written on it. I certainly hope I will! Not to be deterred, I booted up iRacing, and clicked over to the options. I tried stepping on the brake again to see how the brake meter would react. Good! I didn’t brake anything in the pedals! :) But scary! It’s much, MUCH stronger than the stock spring. I really started to wonder if I could get used to it. But I had to try it driving. I stepped into an iRacing test session…oh boy. I thought I may have made a mistake. It was difficult to find the feel of the brake. I started to notice my wheeled office chair moving a little bit more than I’m used to. I’m on a very reasonable carpet and, with the stock springs, I was very confident in pushing the pedals as hard as I wanted and I knew I wouldn’t really move. But the chair is now rocking a bit. I started to consider wheel stoppers, or some fix, to help with the chair. The Inside Sim Racing guys call this a ‘sockable’ modification meaning us hobbyists can still drive in our sock feet without worrying about hurting our feet or getting too tired. It is doable but you may need to make some adjustments to your seat and definitely you’ll have to get used to the new pressure on your feet against the pedal as you push. After a few laps, I got out of the sim and started thinking about adjustments to my chair. The only thing I could do immediately is stiffen up the back of the chair so that it wouldn’t lean so easily because my back is now pressing into the chair as I push on the stiffer pedal. The chair is actually handling quite well, though, because the carpet is a decent thickness and composition. The chair sinks into it a little bit and that prevents it from rolling. After a little bit of research, I felt the urge to get back in and try it out again so I booted up the sim. Again it felt very worrisome for a few laps but I started to feel my way through the brake. It’s begun to feel doable, like I could keep using the pedal. I started to think about what could be done to the chair. The most promising idea is taking out the wheel casters and replacing them with pegs, something you should be able to buy at Staples, maybe. 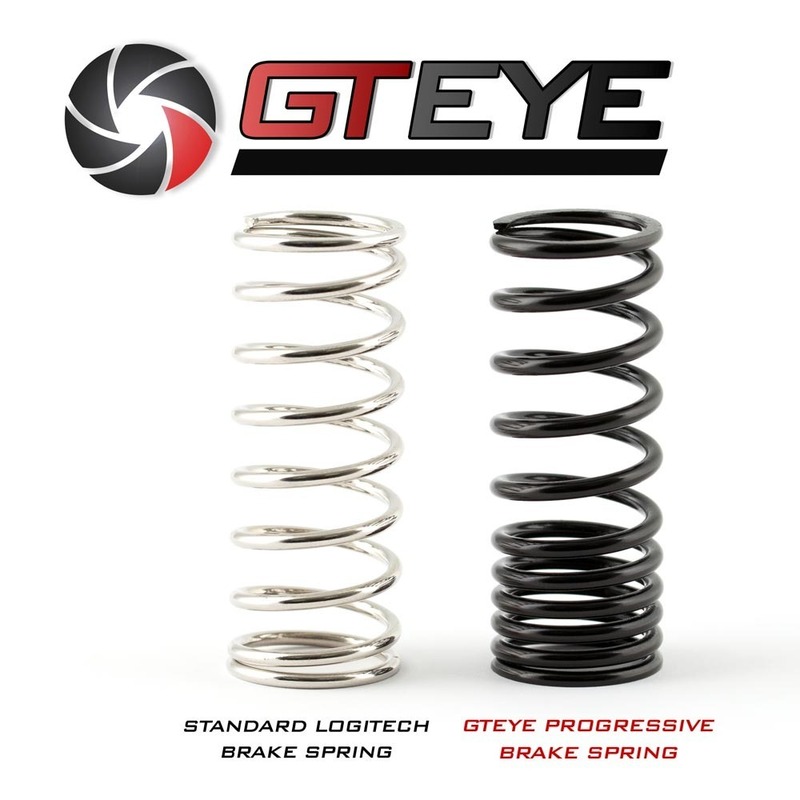 The GTEYE spring is about 3 to 4 times as stiff as stiff as the stock spring at the top and apparently 80% stronger in the progressive portion of the spring at the bottom according to an email with GTEYE guys. Still, you will be surprised when your foot actually gets on it. I actually wish there was a progressive spring out there maybe even the same stiffness as the original or a bit more but not really any more than that. Maybe the top half could be the original strength and the bottom half could be the progressive part (it already is per email from GTEYE guys). As a sort-of casual, hobbyist sim racer I want to be comfortable but I also want to have a better feel for the brake. On a 1:52 track for me, which I can consistently run and run very well, my first few laps I crashed out with the new brake spring. After a few laps, I was able to get a 2:07 (!). A few laps after that I was able to get a 1:56 and I actually stayed there for a few more laps until I got a 1:54. I’m still not at my regular pace but I’m now fully convinced braking has got to be one of the most important, if not the most important, thing in racing. This is interesting! All that pressure you need to put on the brake will mess you up on the gas pedal, hopefully only initially. It’s funny it didn’t occur to me that it could mess up my gas pedal feeling but it did. I must have felt subconsciously that if the brake pedal was that stiff then I needed more muscle on the gas pedal. So for corners where I was very confident coming out of I was over accelerating and spinning around. Talk about your law of unintended consequences! I run barefoot on a treadmill and, as is probably common among us barefoot runners, I’ve strained my Achilles’ tendon and have to take it easy on it. Well, the brake spring isn’t helping with that! That’s why I wish it was perhaps only slightly stronger than the stock but still with a progressive feel. So, beware anyone with Achilles’ tendon issues. This brake spring might cause you grief. I have yet to see if mine will hold up to this. So, would I recommend this pedal? For $30, I don’t think you can go wrong as long as you have a stable pedal mount, a stable chair, and don’t have too much issue with your ankles which you’ll be putting a whole lot more pressure on now. Given that it’s the only ‘sockable’ progressive spring out there for a very reasonable (given the options) $30 I would recommend it. It’ll take some getting used to but I can already sense why people have been recommending these, and load cells, over the stock, non-progressive, overly easy springs that the G27 comes with. I can already feel myself getting to know the new brake spring and understanding when and where its benefits are going to come in. Well, I’ve only had the brake spring a few hours so I’m going to get back in the game. I’ll probably post some updates here in the coming weeks and days! Pingback: Sim Racing Ergonomics | Selah. Previous Previous post: Literally: Sad, Frustrated, Distracted. But Love. Church Heresies Then and Now.